Christmas Lessons on the Castle Doctrine from Ralphie and Ol’ Blue - Harrison White, P.C. We have all seen the movie “A Christmas Story,” written and directed by Bob Clark and Jean Shepherd and released in 1983 just in time for Thanksgiving. I remember the Red Ryder BB gun especially that Ralphie, played by Peter Billingsley—and later me, as you will see—wanted so, so badly…so badly that he went to great measures to ensure its placement under the tree just for his exclusive enjoyment. Now Ralphie had quite an imagination, as most of us did growing up. He dreamed of saving his family while daydreaming at the family dinner table, firing that most coveted Red Ryder BB gun, so treasured by all the kids in that era. The point here is simply this: You may use that force necessary to neutralize the threat if the danger and peril appears to be imminent. However, if the bad guy is retreating you must not use that deadly force. This part of the law is complicated because each situation is different. Please call me to discuss this if you find yourself in a pickle over the holidays. 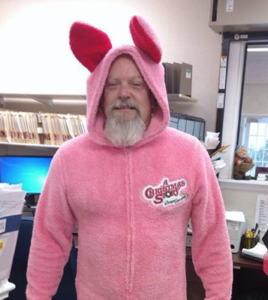 I will appear in my bunny suit and represent you vigorously. Unlike Ralphie, I feel comfortable in pink as pink is the new grey. Seriously folks, if you need any guidance regarding the law and how you apply it to your situation, call on me 24/7. Read my bio here and find out how I can help you.